This luxurious well equipped, first floor apartment is a development on the edge of the Costa Vicentina National Park. The apartment has views of the village and the sea from both balcony and large private roof terrace. The village location is ideally situated for exploring the beautiful Western Algarve, renowned for its stunning beaches and excellent golf courses. The onsite facilities include a communal swimming pool with children's pool, showers & toilet facilities. The village is a 5 minute walk away with shops, and a good selection of bars and restaurants. The superb unspoilt beach is a 10 minute walk away. Golfers are catered for with Boavista and Parque da Floresta 10 minutes drive away. Tennis courts are 5 minutes away and horse riding 10 minutes. The historic town of Lagos is a 10 minute drive away. Cliff top walks can also be made in both directions East & West. Saturday preferred, but negotiable. Normal arrival time after 2pm, normal departure time 10am. Other times may be negotiable depending on adjacent bookings. Apologies but we are unable to accept rental periods over 30 consecutive days. Prices are for the property per week in UK Pounds for an occupancy of 4 people. For additional guests requiring the fold out bed an extra £40 per stay will be charged to cover additional cleaning and laundry costs. Arrivals after 6.30pm will attract a surcharge of £40, this is levied on us by the Management Company as an out of hours charge for the Meet & Greet service. Master bedroom has en-suite with shower, toilet and bidet. Bathroom 2 has bath with shower, toilet. Guest bathroom has underfloor heating, sockets for shavers and are provided with complimentary luxury handwash and shower gel. Lovely beach with Beach Bar. Bed linen is provided, for stays longer than a week the linen is changed mid stay. Tumble drier is located in the storeroom. The apartment is equipped with WiFi, the passcode will be given to you on arrival. Towels are provided and will be changed mid stay, however beach towels are not provided, these can be hired locally, please ask. Spacious lounge with separate recessed dining area, with sofa and single chairs. Air con/heating, 32" flat screen TV, DVD player and selection of films and books. Dining table with 6 chairs. Doors open onto the balcony with sea view and Burgau village. Fully fitted kitchen with granite work tops. Fitted appliances, oven hob, microwave, fridge freezer, dishwasher, washing machine, kettle, toaster, kitchen utensils, crockery cutlery and glassware. The external kitchen door opens directly onto the balcony. Private Roof Terrace with sun loungers. Available at Burgau Sports Centre, and the nearby Golf complexes. The Western Algarve has the perfect Spring and Autumn climate for golf. Golfers are very well catered for with the spectacular and challenging Parque da Floresta course a 10 minute drive further West from Burgau, and the equally challenging Boavista a 10 minute drive East from Burgau. Penina approximately 30 minutes drive East from Burgau was the first Algarve course to be built and has hosted the Portuguese Championship a number of times. Notes on accommodation: Electrically operated shutters/blinds. Terracotta tiled floors. Air-conditioning heating/cooling system with built-in dehumidifier in bedrooms, lounge and dining area. External door with security locking system. Underground car parking space. Wifi. Outside: The large balcony has a built in BBQ, outdoor furniture with table and chairs to seat 6, views over the village and it also has a sea view. The extensive private roof terrace offers panoramic views of the sea and the village. Sun loungers, parasols and table with with 4 chairs are provided. The private roof terrace which is accessed via the private storeroom, has superb sea and village views and is excellent for sun bathing and relaxing. There is also a selection of outdoor games and beach games. Guests have exclusive access to the Burgau Club which houses the communal pool, toilet & shower facilities. Utility Room: The tumble dryer is located in the upstairs private store room, along with a further fridge when using the private roof terrace. For winter months duvets are also stored securely in this room for client use. Cleaning / Towels / Linen / Maid service: A maid service is provided for mid and end of week cleaning and towel changes. Additionally, bed linen is also changed for stays of longer than a week. Towels and linen are provided and should not be taken to the beach. Beach towels available to hire. 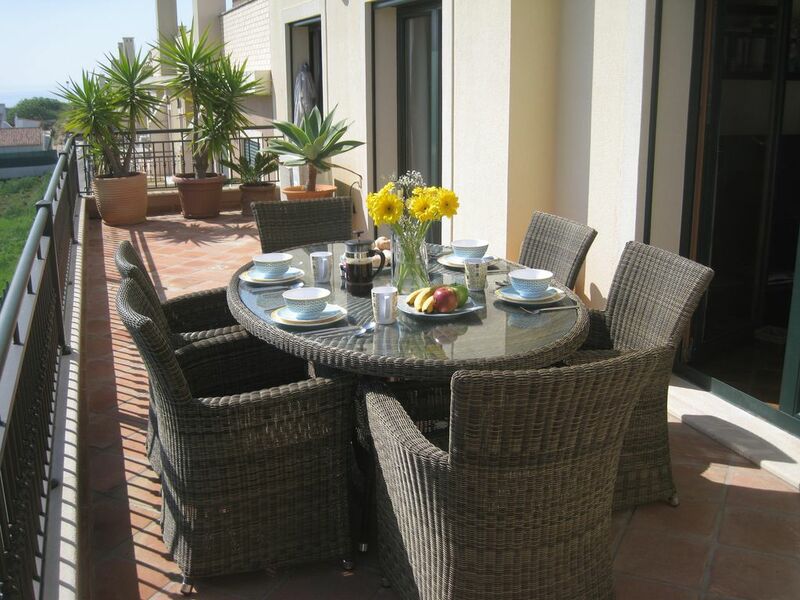 Other: Extensive private roof terrace with sun loungers/parasols and panoramic sea/village views. Large balcony with sea/village views running the entire length of the apartment accessible from all rooms. Balcony has built in BBQ, outdoor furniture and 6 chairs. Very well equipped & presented. Excellent apartment. Very positive experience. Owners & meet & greet were very helpful, despite booking at the last minute. A quality apartment with everything you need in an excellent location. An easy walk into Burgau and well placed for exploring the western Algarve. Lovely apartment, very well equipped. The sun terrace off all rooms is perfect in the morning, the roof terrace sublime all day. Really only fit for four people, though: we had five (one in a z bed), but that was in the living room and made it feel a little cramped. Plus, downstairs complained about the noise of the bed on the tiles. Overall, a lovely apartment in a very sweet village and well worth booking. We really enjoyed our stay at Ian and Gillian's apartment in Burgau. It had everything we required as well as fantastic views over Burgau. Home from Home. Everything just perfect . Could not find any faults. Furniture and equipment all here. Area beautiful. Apartment so peaceful with amazing views. The superb beach at Burgau is just a 5-10 minute walk from the apartment, and has its own beach bar serving drinks and day time snacks. There are many other local beaches just a short walk and drive away. Wind surfing is also available locally, along with boat trips around the coast. Burgau is about 1 hours drive from Faro airport. Car hire is available, or there are local buses or taxis. Transfers can be arranged, please enquire. Lagos is a 15 minute drive away. Cape St Vincent, the furthest point West is about 40 minute drive. Albufeira about 40 minutes. The Monchique Mountains are around one hour's drive away. There is a bus stop in the village with regular services to Lagos, Luz, Salema etc. Burgau has a very good selection of excellent bars and restaurants all within walking distance of the apartment. There are 2 small supermarkets for provisions, wine & spirits shop, small gift shops and a cash machine in the village. The small Burgau Sports Centre on the edge of the village has tennis courts, squash courts, coaching is available, keep fit classes are also run. Horse riding is available within 10 minutes drive. Lagos marina has numerous boat trips for dolphin watching, fishing, general charter, picnic boats for visiting the caves and grottos down the coast. For children, the beach is a 5 to 10 minute walk, other attractions are Zoomarine, about 40 minutes drive, and water parks. For the more adventurous, jeep safaris, mountain biking, climbing, quad biking, land yachting, scuba diving, variety of water sports. All available within a very short driving distance of the apartment. Opened in November 2008 is the Autódromo Internacional do Algarve, F1 standard motor racing circuit near Portimao, 35 minutes drive. Regular race meetings are held throughout the year, with a WSB round now being a yearly event. Booking Notes. Changeover Day: Saturday preferred, but negotiable. Normal arrival time after 2pm, normal departure time 10am. Other times may be negotiable depending on adjacent bookings. Apologies but we are unable to accept rental periods over 30 consecutive days. Notes on prices: Prices are for the property per week in UK Pounds for an occupancy of 4 people. For additional guests requiring the fold out bed an extra £40 per stay will be charged to cover additional cleaning and laundry costs. Arrivals after 6.30pm will attract a surcharge of £40, this is levied on us by the Management Company as an out of hours charge for the Meet & Greet service.